As part of a Blog Tour organized by Great Escapes Virtual Book Tours, I recently had the pleasure of reading Killer Tied by Lesley A. Diehl. I really liked this book. Eve was true to form – likable, spunky and determined. Even more so when her PI apprenticeship forces her to root out the secrets of her own family’s past. Could she be related to a murderer? In her pursuit of the truth she is helped by a familiar cast of family and friends, including a loving grandmother and an amazingly likeable Mafia mob boss. Family was very much at the center of this book – from the murder investigation, with suspects on both Sammy and Eve’s family trees, through to loving glimpses into the newlyweds’ experiences in juggling the parenting of three young boys. Diverse characters and interesting twists made this a very enjoyable read. Note: Although this book is part of a series, it can definitely be enjoyed as a standalone. Thank you for your review and information on “KILLER TIED” by Lesley A. Diehl as well as being part of the book tour. Thanks, Cassidy, for reviewing Killer Tied. I’m so pleased you found that Eve came through for you once again. 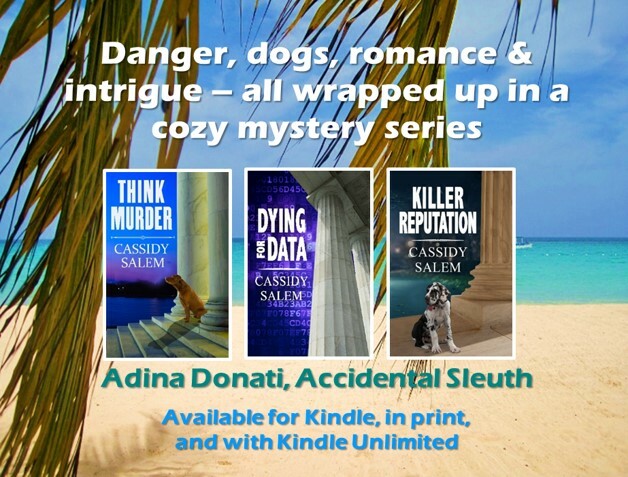 Pingback: Do I still write cozy mysteries?